Extreme metal music (EMM) is both an umbrella term and a sub-category of heavy metal. Although women have a small but steady presence in heavy metal, this number shrinks when applied to the EMM scene. Using ethnographic research, participant-observation and interviews, this study surveys women in New York’s EMM scene to address participation, gender performativity and feminist musicology. 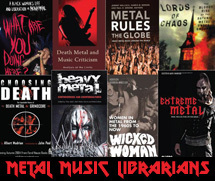 Jocson-Singh, Joan M., “Individual Thought Patterns: Women in New York’s Extreme Metal Music Scene” (2016). CUNY Academic Works.